Wedding Arras (13 pcs) with a Miniature Chest Box, an Our Lady of Guadalupe Medallion and a White Case. Golden - Plated Wedding Unity Coins. Arras de Boda. Most often, the padrino/madrina de arras passes the coins to the priest, which are encased in an ornate el cofre (miniature chest). After the arras blessing, the priest passes the coins to the bride, who places them in the groom's cupped hands. The groom then pours them back into the bride's cupped hands and places the box on top. WEDDING ARRAS: 13 identical golden Wedding Arras (1" x 1" x 0.1") with the Image of Our Lady of Guadalupe in front and with the Biblical Passage "Lo que Dios une que no lo separe el hombre" in the back. MEANING: The symbolic gesture communicates the couple's trust in each other to share the responsibility of managing the household finances. The groom makes a pledge to provide for his family while the bride vows to honor the blessings God has put into their lives. The coins are also a good luck token to ensure the couple will never be without money. NOT DIVIDABLE: 13 is an odd number, which is not dividable; just as a strong marriage should be. 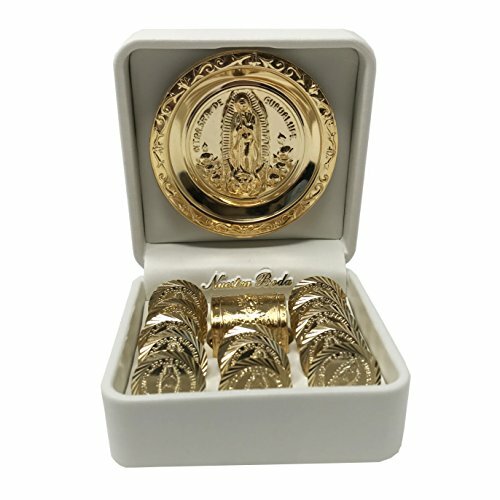 MINIATURE OUR LADY OF GUADALUPE CHEST BOX: 1" x 1" x 1" miniature box to keep the 13 pieces of unity coins. It includes a small lock, which can be easily removed. ARRAS SET BOX: Besides the 13 golden Wedding Arras and the Miniature Chest Box, the set includes an Our Lady of Guadalupe Medallion (3" x 3" x 0.2") and a White Box (3.5" x 3.5" x 2") to keep all its pieces together. View More In Decorative Urns. If you have any questions about this product by Virgen Morena, contact us by completing and submitting the form below. If you are looking for a specif part number, please include it with your message.